LANCASTER – The University of Antelope Valley Pioneers (12-12; 10-2 Cal Pac) returned to their winning ways on Saturday afternoon, defeating the Eagles of Embry-Riddle (13-13; 6-6 Cal Pac), 85-60, in intercollegiate California Pacific Conference men’s basketball action inside the Pioneer Event Center. With the win and a Simpson loss to UC Merced on Saturday, UAV now leads the Cal Pac standings by two games and is one victory away from clinching the top seed in the upcoming Cal Pac Championships. 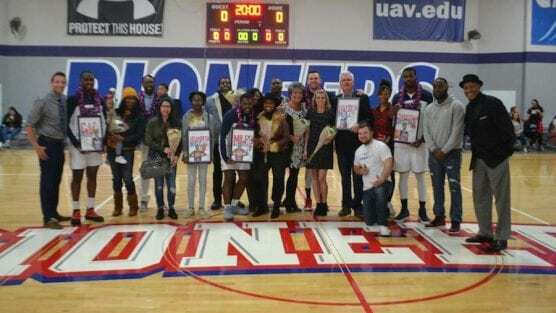 It was fitting that on a day in which UAV’s five senior players were recognized before the start of the contest that the Pioneers would play well in front of their family and friends, outscoring the Eagles by 21 points in the second half, 51-30 en route to cruising to the 85-60 victory. UAV senior forward Christian Drayton (Lufkin, TX) collected his sixteenth double-double of the season, more than double that of any other play in the Cal Pac, scoring a game-high 20 points and game-high 13 rebounds to go along with two blocks and two assists, junior guard Kamal Holden (Los Angeles, CA) added 11 points, three boards, two assists and two steals, and senior guard CJ Bussey (Seattle, WA) and junior forward Kane Keil (Auckland, New Zealand) each dropped 10 points. UAV hit 32-of-54 field goals (.593), 7-of-21 three-pointers (.333), 14-of-22 free throws (.636), and outrebounded the Eagles, 41-25. UAV committed 22 turnovers and stole the ball 10 times. ERAU made 22-of-62 shots (.355), 4-of-19 three-pointers (.211) and 12-of-18 free throws (.667) and committed 16 turnovers and stole the ball from UAV 10 times. Next game: Coached by Darwin Cook, the Pioneers hit the road to face UC Merced for a California Pacific Conference contest on Thursday, Feb. 14 at 7:30 p.m. PST in Merced, Calif.